CNN's Campbell Brown: 'Why Not Be Open to Trying' ObamaCare? 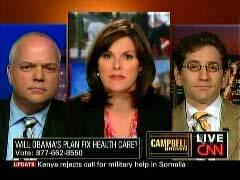 CNN anchor Campbell Brown used a proponent's own talking point about President Obama's planned health care socialization as she pressed a doctor over his skepticism of the project during her program on Monday: "There's plenty of evidence...that...two-thirds of all bankruptcies in this country [are] due to people's medical bills. It's clear the current system isn't working, so why not be open to trying this?" Brown hosted Dr. Jorge Rodriguez, a supporter of the president's plan, and Dr. Eric Novack, a senior fellow for the conservative Americans for Prosperity, for her regular "Great Debate" segment. After an opening statement from the two doctors on the health care issue, the anchor asked Dr. Rodriguez, "What do you say to critics who charge what we're talking about, what we're debating is really socialized medicine- that people envision hours of waiting to get into- you know, to get to see a doctor, the rationing of our health care?" When he replied, and following a back-and-forth between the two physicians, Brown turned to Dr. Novack and used a talking point Dr. Rodriguez had earlier used: "Doctor Novak- again, without getting into the specifics, which we don't have all the details on- you heard what Dr. Rodriguez said about the number of bankruptcies- and there's plenty of evidence to suggest this- that 53%, or two-thirds of all bankruptcies in this country [are] due to people's medical bills....I mean, it's clear the current system isn't working....So why not be open to trying this?" The conservative doctor took issue with the figure: "Well, first of all, Campbell, the study that showed- that claimed to demonstrate the number of medical bankruptcy- the number of bankruptcies due to medical conditions was actually done by people who are the most avowed people in favor of Canadian-style single-payer health care." The CNN anchor interrupted with a follow-up: "So you think the current system is working?" Dr. Novack acknowledged the "serious flaws" with the health care system today, but continued with further skepticism: "The question of what's being discussed is the health care that you enjoy, your children enjoy, my children enjoy, is essentially at risk....So...what we're saying is that we should throw all of this away because of a plan that might work? I think some evidence would be helpful." Dr. Rodriguez answered this with his own retort: "There are- you know, I think it's very ironic that you say the health care that your children enjoy, the health care that I enjoy, but there are 47 million people and children that don't enjoy any health care whatsoever....Now who's going to protect them?" The CNN anchor closed the segment with her usual question to her debate segment participants on whether the two could find "common ground" on the controversial issue. Despite her "socialized medicine" question to Dr. Rodriguez, Brown was more pressing with her line of questioning to her conservative guest. - Matthew Balan is a news analyst at the Media Research Center.